EOSAT SPACENanoX – SPM300 module is designed to be incorporated as a standalone or integrated payload module for small Cube & Micro Sat’s. The main processor is based on the Xilinx MPSoC family, and as such the product is targeted at high-reliability, high performance control and processing applications. Xilinx's MPSoC family is a heterogeneous processing platform combining a processing system (PS) with field-programmable logic (PL) all in the same device. The module is configured with 64 bits of general purpose IO (GPIO) which can be fully configured to application specific requirements. Further expansion options can be provided utilising the on-board high-speed root hub. The root hub allows up to four other I/O and network card expansion capabilities. The on-board system controller is responsible for the power control and monitoring of all modules fitted within a cube or Micro sat chassis. Diagnostic information and fault history is logged within the system controller and can be accessed via the Intelligent Diagnostics Platform Interface (IDPI) enabling rapid diagnostic information to be captured during a mission. In today’s commercial avionics, Defence Airborne and Land electronics the need for higher performance while decreasing Size, Weight and Power, Cost (SWaP-C) is gathering momentum. The power supply is a key determining factor in the final system size, weight, and thermal design. ELEK-TECH Electronic Systems will discuss methods for satisfying your system’s power requirements with efficient, cost-effective power design. One way that ELEK-TECH Electronic Systems customers can decrease the power footprint is to move to our modular distributed power architecture, which comprises of our small form factor Electronic Payload Modules. Our PSU EPM’s can be controlled digitally and have in built BIT for diagnostics, all controlled by our Integrated System Controller (ISC). The system controller is responsible for the power control and monitoring of all modules fitted with in the chassis and can be accessed through our Intelligent Diagnostics Platform Interface (IDPI). Instead of having several isolated supplies to drive the internal loads, our distributed architecture has one isolated converter and multiple, smaller, dense point of load (POL) converters. POL converters offer the advantages of smaller size, higher efficiency, and better performance than the isolated power converter method. Many Defence avionic systems have a power source that is governed by MIL-STD-704. 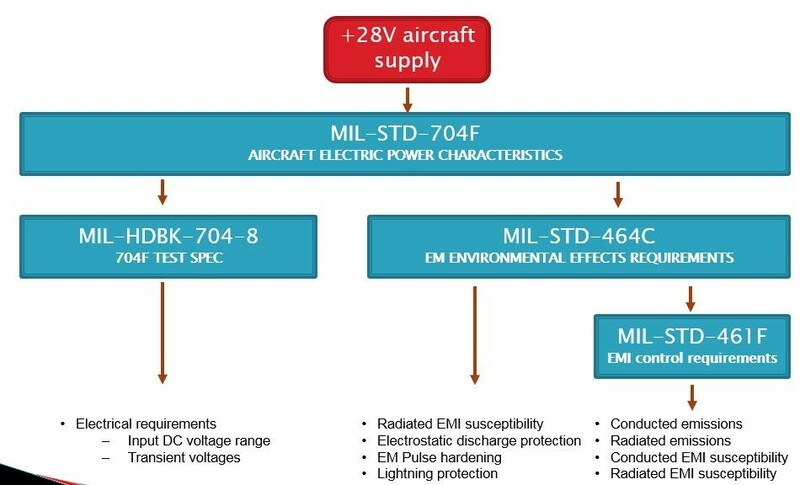 MIL-STD-704 highlights the power source limits for various conditions that include both transient and steady state limits. For example, MIL-STD-704 Rev F has transient limits for 28V DC systems to be between 18V and 50V. Many applications in the Defence avionics systems are required to meet older revisions of MIL-STD-704 which can contain even more severe transients between 16V and 80V. These large input ranges, coupled with many systems having an isolation requirement, make some type of isolation stage between the source and load required. ELEK-TECH ELECTRONIC SYSTEMS work very closely with GAIA Converters UK who supply high power density COTs Power modules, these are what we normal place at the front end of our system. Has they are fully compliant to MIL-STD-704 transients and abnormal voltages it minimises the risk at the subsystem level. Today’s high performance digital systems also require ultra-tight regulation on the output voltage to prevent damage. We accomplish this by locating dense POLs very close to the load this could be an FPGA, Processor or fast sampling ADC\DAC. This decreases the load variation by eliminating the need for long copper traces on a circuit board and because of their small size and light weight, it’s possible to mount POLs very close to the load, which saves space by eliminating the potential requirements for large heatsinks or mechanical reinforcing structures. Another very useful function to look for is the ability of a POL to control the timing and ramp rate of rise and fall of the output voltage. This is often done by accessing the “Track” pin on the desired POL. The track pin allows us to control the rate of rise of the output voltage by placing an external signal at the track pin. The use of the track pin, is extremely useful if multiple voltages are supplying the same part and negates race conditions of supplies for example FPGA Core & I/O. The track pin is flexible and can be configured to suit your system. If our customers’ specific needs are to reduce the load transient performance, adding a bulk capacitance to the output pins is possible. This capacitance can decrease output voltage variations from very fast load current changes. Finally, should we want to decrease the input current ripple, a bulk capacitor can be added to the input of the POL. There is no upper limit to the amount of capacitance that can be added to the input of the POL. The only limit you’ll need to account for is if the POL is driven from another DC-DC converter. If so, then this part could have a requirement for the maximum amount of output capacitance. Modular Power Payload Architectures for Next Generation Electronic Systems. With the new variety of Modular Power Payload Modules, today’s commercial avionics, Defence Airborne and Land systems our customers have smarter, newer options in designing high performance systems that meet evolving light weight, high performance, and low cost system requirements. This blog is about giving a general overview of MIL-STD-704 for Airborne systems, may be useful for apprentices, graduates or Junior designers who have started out in the Aerospace sector. At ELEK-TECH ELECTRONIC SYSTEMS here in the UK we design our products to meet such requirements ensuring piece of mind for our customers and end users. This standard establishes the requirements and characteristics of aircraft electric power provided at the input terminals of electric utilisation equipment. MIL-HDBK-704-1 through -8 defines test methods and procedures for determining airborne utilisation equipment compliance with the electric power characteristics requirements defined herein. Electromagnetic interference and voltage spikes are not covered by this standard. This standard establishes electromagnetic environmental effects (E3) interface requirements and verification criteria for airborne, sea, space, and ground systems, including associated ordnance. This standard establishes interface and associated verification requirements for the control of the electromagnetic interference (EMI) emission and susceptibility characteristics of electronic, electrical, and electromechanical equipment and subsystems designed or procured for use by activities and agencies of the Department of Defence (DoD). Such equipment and subsystems may be used independently or as an integral part of other subsystems or systems. This standard is best suited for items that have the following features: electronic enclosures that are no larger than an equipment rack, electrical interconnections that are discrete wiring harnesses between enclosures, and electrical power input derived from prime power sources. 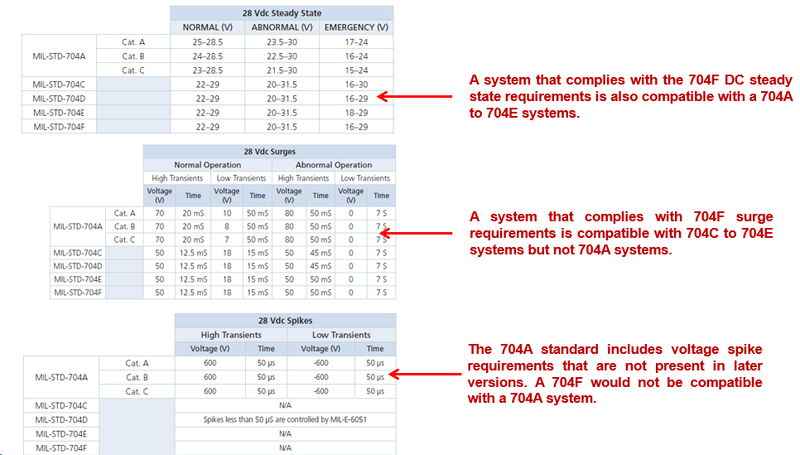 This standard should not be directly applied to items such as modules located inside electronic enclosures or entire platforms. The principles in this standard may be useful as a basis for developing suitable requirements for those applications. Data item requirements are also included. Normal operation occurs when the system is operating as intended in the absence of any fault or malfunction that degrades performance beyond established requirements. It includes all system functions required for aircraft operation. Normal operation characteristics shall be in accordance with figures 13, 15 and table IV. Utilisation equipment shall provide the level of performance specified in its detail specification. Abnormal operation occurs when a malfunction or failure in the electric system has taken place and the protective devices of the system are operating to remove the malfunction or failure from the remainder of the system before the limits for abnormal operation are exceeded. The power source may operate in a degraded mode on a continuous basis where the power characteristics supplied to the utilisation equipment exceed normal operation limits but remain within the limits for abnormal operation. Overvoltage and under voltage values shall be within the limit of figure 14. Utilisation equipment shall be permitted a degradation or loss of function unless otherwise specified in its detail specification, shall not suffer damage or cause an unsafe condition and shall automatically resume full performance when normal operation of the electrical system is restored. Emergency operation occurs following the loss of the main generating equipment when a limited electric source, independent of the main system, is used to power a reduced complement of distribution and utilization equipment selected to maintain flight and personnel safety. The DC steady state voltage in emergency operation shall be between 16 and 29 volts. Utilisation equipment shall provide the level of performance specified in its detail specification when such performance is essential for flight or safety. Electric starting operation is a specialised case of normal electric system operating conditions where the normal voltage limits may be exceeded due to the high electric demand. The DC voltage in electric starting operation shall be between 12 and 29 volts. Electric starting of an auxiliary power unit (other than battery starts) is a normal operating function and is not included. Utilisation equipment shall provide the level of performance specified in its detail specification when performance is essential during the starting operation. Transfer operation occurs when the electric system transfers between power sources, including transfers from or to external power sources. Transfer operations are considered to be a normal operation. Under conditions of bus or power source transfers, voltage and frequency shall not vary between zero and normal operating limits for longer than 50 milliseconds. A normal transient may occur upon completion of a transfer. Utilisation equipment may not be required to operate under the transfer condition unless a level of performance is specified by its detail specification. Utilisation equipment shall automatically resume specified performance when normal operating characteristics are resumed. All electrical power input terminals, including AC neutral and DC negative terminals, shall be electrically isolated from case ground. Equipment chassis shall not be used for power returns. DC equipment shall not be damaged by reversal of positive and negative connections. Employing a positive physical means to prevent phase or polarityreversal shall also fulfil this requirement. Equipment having multiple input terminals for connection to more than one power source shall isolate the inputs from each other so that one power source cannot supply power to another. AC inputs shall not be paralleled. DC inputs shall be protected with blocking diodes if they are paralleled. The unit shall meet the radiated EMC susceptibility requirements defined in tables 5 & 6 of the 464C and limited to a max average field strength of 200V/m. The system shall meet its operational performance requirements after being subjected to the EMP environment. This environment is classified and is currently defined in MIL-STD-2169. This requirement is applicable only if invoked by the procuring activity. Compliance shall be verified by system, subsystem, and equipment level tests, analysis, or a combination thereof. All electrical and electronic devices that do not interface or control ordnance items shall not be damaged by electrostatic discharges during normal installation, handling and operation. The ESD environment is defined as an 8 kV (contact discharge) or 15 kV (air discharge) electrostatic discharge. Discharging from a 150 pF capacitor through a 330 ohm resistor with a circuit inductance not to exceed 5 µH to the electrical/electronic subsystem (such as connector shell (not pin), case, and handling points). Compliance shall be verified by test (such as AECTP-500, Category 508 Leaflet 2). The system shall meet its operational performance requirements for both direct and indirect effects of lightning. We offer a range of fully protected MIL-STD-704F Electronic Payload Modules that can be used to build up a complete Modular Airborne Power system architecture rapidly combined with Health prognostics and intelligent control. We use the latest high power density COTS power bricks to rapidly develop & deploy systems with low risk and cost. Dependant on power requirements we can provide small lightweight distributed portable power units and battery charge management systems with intelligent control for small unmanned system applications. Our clever approach in combining innovative cooling and high efficiency techniques allows us to put more power into smaller places than has been previously demonstrated. However one of the key changes included the survival of electrical equipment when subjected to a DIT08.B Load Dump. System design engineers concerned themselves with the power surges and transients associated with these types of high energy surges, recognising that these were the most difficult to achieve compliance to and had the largest effect on system integration and reliability. Load dump occurs when a heavily loaded electrical system exhibits a loose battery terminal, the resulting voltage transient presented onto the electrical system by the poor connection is defined in the commercial vehicle standard ISO 7637-2. Calculating the energy the 28V DC system load dump surge is around a factor of 4.5-5 times that of the 80V surge. The peak voltage is over 2.5 times the magnitude, meaning that existing Active surge protection designed for issue 5 in the equipment would be inadequate to cope with the Issue 6 energy levels. The 80V surge is seen as a common occurrence on 28V vehicles and it is necessary that the equipment continues to operate continuously throughout the duration of the surge. Most Electronic equipment fitted to 28V vehicles typically utilise front end Galvanically Isolated DC-DC converter technology to reduce the input voltage to lower voltages for the downstream electronic circuitry. The Power conversion efficiency is normally optimised to a typical input range of 36 to 40VDC. Knowing the input voltage range of the front end DC-DC converter, a very common methodology of protection to protect the converter is a simple clamp circuit using a series pass element that prevents the voltage increasing above the maximum allowed input voltage of the front end converter. This circuit could be as simple as a MOSFET with a large reliable SOA (safe operating area) and charge pump circuitry with additional passive components and TVS protection. In normal operation the charge pump provides full enhancement gate bias to the MOSFET so that the device looks like a very low resistance connection from input to output, however during the surge it switches on harder and becomes more resistive. The increasing surge voltage is dropped across this series element (MOSFET) and is dissipated as heat within the device ensuring that the output voltage is clamped below the maximum allowed level. 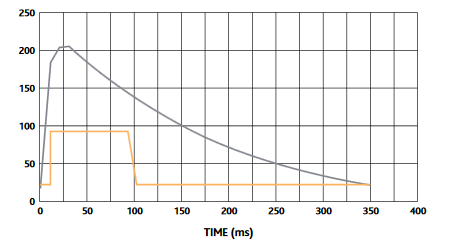 An additional timer circuit can be added to protect the MOSFET from Thermal damage by monitoring the clamp time. During the 202V load dump surge it is recognised that it is actually a rare event and allowing compliance to the specification can include operator intervention, to replace a fuse for instance,and/or temporary interruption of operation of the equipment powered from this rail, Therefore a simple solution would be to detect this large surge voltage and then safely turn the system off. This method of protection is only suitable if the downstream electronics are able to safely shut down in a mode that allows the system to re-boot, once the surge has passed. However some electronic equipment could lose valuable data and be subject to an extended reboot period that might not be acceptable in some environments. Safety Critical and Mission System would not be allowed to fall in to this category, for instance weapon control systems that control many safety interlocks and weapon functionality would need to work through the 'Load Dump' to ensure safety of the Operator and other Personnel. Careful consideration is needed when defining the platform power architecture for the equipment. A combination of allowing some parts of the equipment to shut down whilst maintaining full power to Mission and safety critical equipment often results in the most cost effective and safest solution. EES have designed and developed a comprehensive range of standard COTS high efficiency protection Electronic Payload Modules (EPM) ensuring that the equipment continues to operate during this ‘Load Dump’ surge without any interruption to its output voltage. Our Electronic Payload modules Provide active surge protection, with the output of the EPM being clamped at < 36 VDC.